We are a dental practice oriented toward comprehensive care of adults and children with the capability to provide sedation when appropriate and oral rehabilitation utilizing implant services. 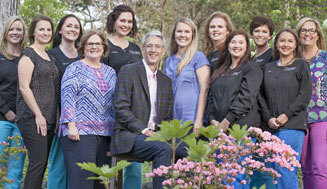 We strive for predictability and longevity in our patient care. Our staff is friendly, caring and motivated with the experience and expertise necessary to guide each of our patients through their own unique dental experience. We know that every patient that joins our family has different needs and expectations and we enjoy working toward each patient's goals together as a team. Dr Temple has been my dentist for several years and he’s always been very friendly and thorough. He takes the time to ask and listen to questions. Very efficient and friendly staff. Hygienists are great, they make cleaning as pleasant as possible. They get you in and out on schedule which for me is a huge plus. Would highly recommend Dr Temple if you’re looking for a dentist. My favorite appointments of the year. I absolutely adore Dr. Temple and his staff. Friendly happy people. We pride ourselves in transforming our patients' smiles. Browse through some of our case studies to see how we have changed their lives. As health care professionals we understand it is not just enough to treat patients. Being part of our community and helping to educate people of all ages about the importance of oral health is an important aspect of our work . That is why we volunteer our time and energy to be an active part of the Winstom Salem community.